Cobra Hi - Perf ATV has been styled just like it big brother the Cobra 220 ATV and Cobra 350 ATV and is an ideal size for the youngster looking for something special. With slightly larger physical dimensions than the Cobra S, the Hi – Perf 100 ATV is powered by a 100cc two stroke engine with auto lube oil injection, Electric start, rear disc brake, drum front brake, adjustable suspension driving through an automatic transition with the addition of being able to select reverse gear through a lever on the right side. 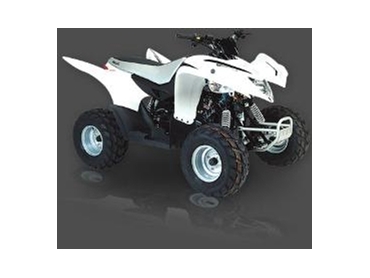 Cobra Hi - Perf ATV is available from Aeon Australia .